Futures for the Dow Jones Industrial Average Friday were down 50 points as oil prices continue to slide and traders make sense of the U.S. Federal Reserve's decision to raise interest rates. On Thursday, the Dow Jones Industrial Average fell 253 points and snapped a three-day winning streak after energy stocks and materials stocks slid. 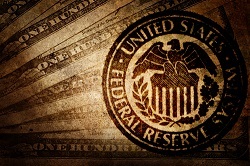 The Fed's decision to boost interest rates for the first time since 2006 took the U.S. dollar to a two-week high but put downward pressure on crude oil and other commodity prices. Gold prices fell 2.5% as the dollar pushed higher. Meanwhile, silver prices fell nearly 4%, while copper slid another 1.4%. All major currencies slid against the dollar. The Stock Market Today: It's time for Quadruple Witching, which means a high-volume day is in store for traders. The event – which happens four times a year – occurs during the expiration of many different stock index futures, stock options, stock index options, and single stock futures. Higher volumes are expected during this event since futures and options traders are required to close out their positions today. Global markets continued to slide today as a stronger dollar and weaker commodities weighed on international companies. Martin Shkreli Fraud Update: Federal authorities arrested pharmaceutical CEO and hedge fund manager Martin Shkreli on charges of securities fraud Thursday. Shkreli is accused of running a shell game at one of his former firms that a U.S. attorney compared to a "Ponzi scheme." Prosecutors allege he engaged in widespread fraud between October 2009 and March 2014. Shares of KaloBios Pharmaceuticals Inc. (Nasdaq: KBIO), a former penny stock that had soared in recent weeks after news of Shkreli's investment, fell more than 50% on the news of his arrest. Shkreli became the face of corporate greed this year after he hiked the price of a life-saving drug by 5,000% and bragged about his wealth repeatedly on Twitter. If he is convicted, he could serve up to 20 years in prison. Oil Outlook: Oil prices continued to slide this morning on concerns about a global supply glut. January WTI prices were down 0.5% at $34.79 per barrel. Meanwhile, Brent oil crude – priced in London – was flat at $37.19. As Money Morning Global Energy Strategist Dr. Kent Moors explains, no one in the international crude oil markets seem willing to blink first regarding falling prices, and that could have serious ramifications for the future. Here's Kent's most recent analysis of what is happening in the crude markets. Earnings Report No. 1, BBRY: Before the market opens, telecom hardware manufacturer BlackBerry Ltd. (Nasdaq: BBRY) reported fiscal third-quarter earnings. The BBRY stock price jumped 5% after the company reported a $0.03 loss during the quarter and beat consensus expectations. Wall Street analysts projected an EPS less of $0.15 on $485.21 million in revenue. Earnings Report No. 2, CCL: This morning, Carnival Corp. (NYSE: CCL) will announce fourth-quarter earnings. Expectations call for earnings of $0.41 per share with revenue coming in at $3.721 billion. Additional companies reporting earnings today include Darden Restaurants Inc. (NYSE: DRI) and CarMax Inc. (NYSE: KMX). Stocks to Watch No. 1, AAPL: Shares of Apple Inc. (Nasdaq: AAPL) have struggled in recent trading sessions as investors raised concerns about the company's iPhone shipments this quarter. The stock is down nearly 0.5% this morning after falling roughly 2.1% yesterday. Despite rumors, the company is also not planning to purchase Elon Musk's electric vehicle and battery manufacturer Tesla Motors Inc. (Nasdaq: TSLA). Finally, Apple announced plans to launch its Apple Pay service in China as soon as 2016. The firm will face stiff competition from e-commerce giant Alibaba Group Holding Ltd. (NYSE: BABA). Stocks to Watch No. 2, QIHU: Shares of Qihoo 360 Technology Co. Ltd. (NYSE: QIHU) added nearly 3% this morning on news that it will be taken private. The Chinese mobile security giant announced it will be purchased for roughly $9.3 billion. The deal includes roughly $1.6 billion in debt. Stocks to Watch No. 3, CQP: It's a tough time to be in the natural gas markets. Shares of Cheniere Energy Partners LP (NYSEMKT: CQP) hit a 52-week low as cratering natural gas prices weigh down the stock's balance sheet. Stocks to Watch No. 4, AMZN: In an effort to cut out the middleman in its logistics operations, Amazon.com Inc. (Nasdaq: AMZN) is reportedly in talks with Boeing Co. (NYSE: BA) to lease at least 20 jets to create its own air-freight service. The company is looking to reduce service delays during critical commerce seasons, as noted with the decline of on-time deliveries during the fourth quarter by United Parcel Service Inc. (NYSE: UPS). Richmond Federal Reserve President Jeffrey Lacker speaks at 12:30 p.m.